The devil may seem like a strange topic for us to study. In our society, you just don’t talk about Satan and his demons. If you do, people will point at you and call you crazy. That being said, the devil and his demons are very real and they are out to take down Christians any way they can. So there is an important lesson for us to take away from this verse. The words spoken by the evil spirit are very interesting. And they lead us to three very important conclusions. First, the demon says he recognizes Jesus. Satan and his demons where once angels and had direct access to God. (Revelation 12:9) They don’t dispute the fact that Jesus is the Son of God because they know it is true. They know exactly who Jesus is and what He has done for humanity. Second, the demon knows about Paul. Paul was on fire for Jesus! Everywhere he went he was preaching the gospel and winning people to the kingdom of God. The devil and his demons were very aware of this. If we back up a bit and look at Acts 19:11-12 we can see what Paul was doing that made the demons aware of him. And God was performing extraordinary miracles by the hands of Paul, so that handkerchiefs or aprons were even carried from his body to the sick, and diseases left them and the evil spirits went out. Paul was traveling through Ephesus and God was allowing him to perform miracles and cast out evil spirits because of his faith in the Lord Jesus. When we think of the city of Ephesus, we usually think of the inspiring book of Ephesians. But during Biblical times, Ephesus was known as a place full of false magicians and wizards who would use incantations. When the people of Ephesus saw the miracles that Paul was able to perform in the name of Jesus they started talking about it and word caught on about what he was doing. Some men (the exorcists in verse 13) decided that they would do the same thing for their own purposes, probably to make money. But they had a problem, they didn’t know Jesus. And because they didn’t know Jesus, they couldn’t perform the same miracles that Paul did. They just didn’t understand that God had the power, not Paul. This is the part I would like for us to focus on because it pertains to us too. These men didn’t have a good answer ready for the evil spirit when they were asked, “Who are you?” But as Christians we do! We know Jesus! That’s who we are! 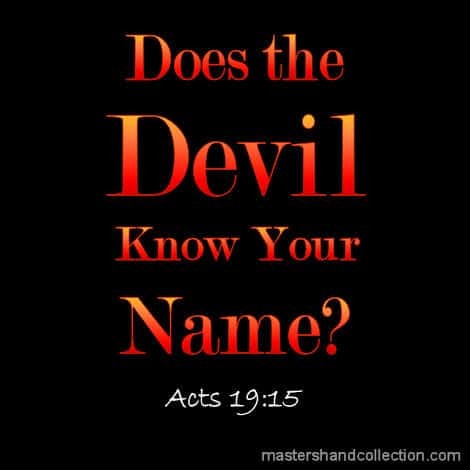 So, back to the question, “Does the devil know your name?” I’m confident that he knows mine! He loves to come around and torment me with my past mistakes. He likes to put doubt in my mind and tell me that I’m no good. And he likes to distract me from the things God would have me to do. Growing up I was afraid of Satan. Isn’t that what we’re taught? Satan is the bad guy and we’re supposed to fear him. But over the years I’ve developed a new outlook. I think Satan should fear me! Like Paul, I’m on fire for Jesus and I hope you are too! My goal in life is to lift the name of Jesus high so that everyone will know Him as their Savior. That might get me brownie points in heaven but it puts a target on my back with Satan and his demons. But that’s okay with me because no matter what Satan does to me I will always belong to Jesus. And I know that I am forgiven for those things in my past and I will be with Jesus in heaven someday. Let’s be clear, Satan is actively seeking to destroy us. (1 Peter 5:8) If he can’t destroy us, then he’ll try to cause us to become ineffective Christians. As long as we don’t tell other people about Jesus or do the good works of the church, Satan will leave us alone. But as soon as we decide that we are going to live for Jesus one hundred percent you can bet that he will know our name. Satan has many tricks up his sleeve and he will use every one of them to try to hurt us. He knows exactly which buttons to push. For some of us, it’s doubt, or illness, or reminding us of our past failures and sins. For others, like myself, it’s distraction. No matter which devious trick he pulls, you can always count on Satan to knock you down and kick you in the teeth when you least expect it. That’s what he does best and he relishes in seeing Christians suffer. 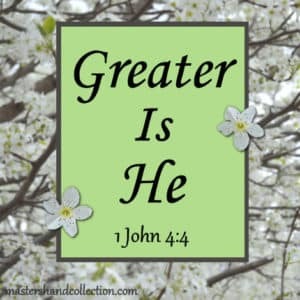 But Jesus is greater than any enemy we face. (1 John 4:4) Satan and his demons are no match for Him. Jesus is already victorious over the powers of darkness! And because we are saved, we share in that victory. As believers, we don’t need to fear the devil because Jesus has already defeated him. There is nothing that Satan can do to us that will ever change the fact that we belong to Jesus, and he knows it. That’s why he should fear us! Christians are called to be outspoken about our faith in Jesus Christ. If we speak up and show up for Jesus, the world will hate us just as they hated Him. And the devil will hate us too. But really, what does it matter if someone as small and insignificant as Satan hates us? Jesus is the Son of God, our Redeemer and the Savior of the world. Satan cowers in fear and hides at the name of Jesus, the name above all names. So, does the devil know my name? What would I say if I was asked this question today? My answer would simply be this, “I’m the girl that knows Jesus by heart and I’m the girl He died for!” That answer alone is enough to send the devil and all of his demons running scared. What would your answer be? Does the devil know your name? Let me know in the comments below. 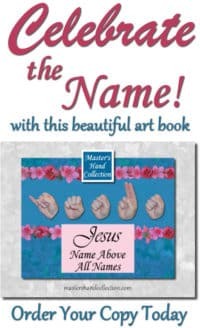 In this inspirational art book, up and coming Christian artist Master’s Hand Collection combines American Sign Language with the beauty of nature to bring the truth of Scripture alive. Each picture in the book is meant to shed light on who Jesus is and why we need Him in our lives today. This is the message of “Master’s Hand Collection Jesus Name Above All Names”. 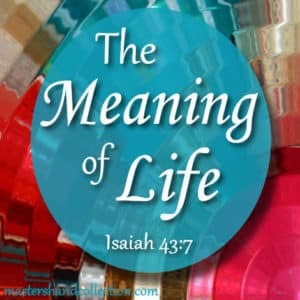 It is a celebration of who Jesus is and a reminder to live for Him every day. May the truth of Jesus bring peace and understanding to your heart as only He can. Oh yeah, he knows and I hope it scares him more than he has tried to scare me. Actually, it’s Jesus he’s afraid of, we could do nothing without Him. The devil met his match and lost, and loses every time. Hi Rebecca, That is very true. Jesus has all of the power and because we belong to Him, we have His power within us. It’s a wonderful thing to be surrounded by the love and might of the Lord Jesus Christ! Blessings! Comment…Great inspiration. Jesus be is the name above all names. Hi Peter! Thanks for the encouragement. God bless!